We will be spending nights camping in secluded bays by campfire and grill.We will have few chances to get some fresh supplies and load the necessary equipment on the way. For exercising and resting from sitting in the kayak we have prepared for you several trekking routes,so if we’ll find time we’ll hike a bit. If you prefer resting and swimming, we have chosen for you the best and most beautiful beaches. Here we also have different games for fun such as Frisbee, volleyball or sand football or Croatian picigin. We will explore caves and dive in them, swim in the turquoise colors of the crystal clear sea, walking along beautiful forest paths, snorkel in the nature park Fjord Zavratnica, observing birds and other animals and many other nature related activities. 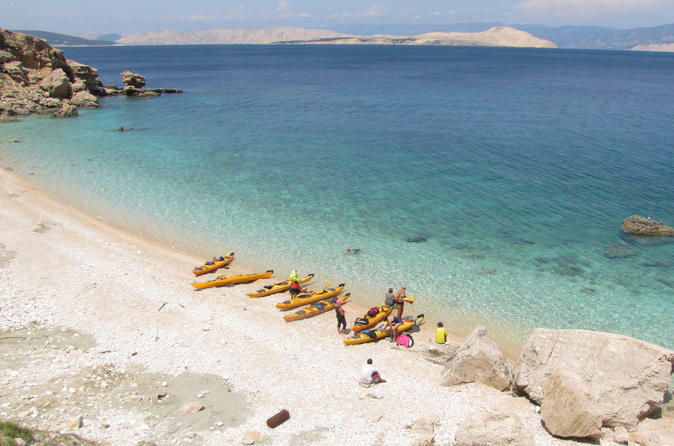 We’ll also visit the two other Islands on the North side of Rab -The Goli Otok and St.Grgur Island known as a former political prison Islands.